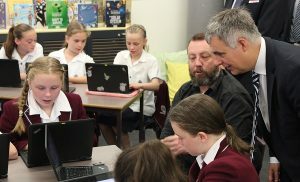 TasmaNet became the first internet service provider in Australia to deliver superfast broadband using new nbnTM Enterprise Ethernet fibre technology after successfully commissioning a 1 Gbps connection for St Michael’s Collegiate School in Hobart today. Managing Director Joel Harris joined nbn Co CEO Stephen Rue, students and staff at St Michael’s Collegiate School in Hobart today to mark the successful commissioning of the first Enterprise Ethernet connection in the country. Mr Harris said that being first in the nation was becoming business as usual for the Hobart-based company. “TasmaNet ordered the first 1 Gbps connection in Australia delivered over the existing National Broadband Network, in 2017 for a wholesale customer, and we worked hard to be first in Australia to order and deliver the new NBN Enterprise Ethernet fibre technology. “We realised immediately how useful the new Enterprise Ethernet technology would be for the business, education, and government customers who rely on us to deliver specialised connection, data protection, and cloud computing solutions,” Mr Harris said. nbnTM Enterprise Ethernet requires a dedicated point-to-point fibre connection to be extended from the existing National Broadband Network into the customer’s premises.